At the NATO AGS unveiling ceremony June 4 at U.S. Air Force Plant 42 in Palmdale, California, Northrop Grumman employees were joined by representatives from industry partners Airbus Defence and Space, Selex EX and Kongsberg. 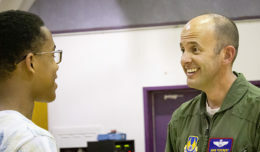 PALMDALE, Calif. — Northrop Grumman’s family of high-altitude long endurance unmanned aircraft systems welcomed its newest member June 4. The new Alliance Ground Surveillance system is the first of five being built for NATO. Northrop Grumman and their industrial partners joined community leaders at Northrop’s Site 3 facility at U.S. Air Force Plant 42 in Palmdale for the NATO AGS unveiling ceremony. The AGS is a modified Air Force RQ-4B Global Hawk (Block 40) that uses the same multi-platform radar technology insertion program sensor. According to John VanBrabant, Global ISR Systems director, the biggest differences are in the ground equipment, which is being manufactured and integrated overseas, and the communications suite. 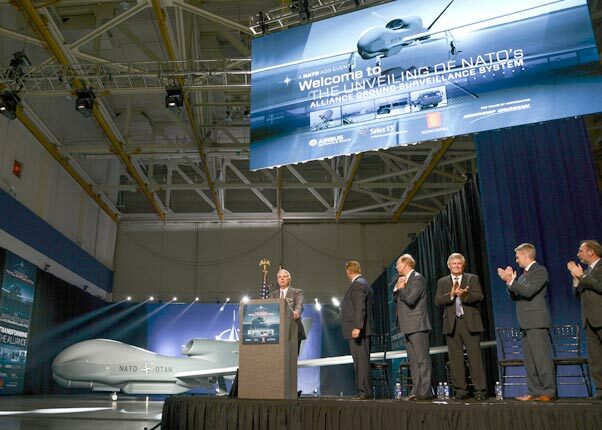 “We have many of the partners that we’ve used for years in the Global Hawk program, but there are just certain parts that are being manufactured overseas by our partners over there – primarily ground segments,” said VanBrabant. The primary industrial team includes Airbus Defence and Space from Germany, Selex ES from Italy and Kongsberg from Norway. Representatives from each spoke during the unveiling ceremony. Project managers are hoping for a ferry flight to Edwards AFB late this summer to complete flight test and envelope expansion. If there are no delays, “NATO 1” will be ferried to its new home at Sigonella Air Base, Italy, by spring of 2016. The operational aircraft will serve as a wide-area, all weather, 24-hour surveillance capability to provide clear pictures of any situation on the ground to participating NATO countries and national authorities. The system is capable of up to 30 hours of flight at a time and has the ability to fuse sensor data, continuously detect and track moving objects and provide detailed imagery. The Joint Intelligence, Surveillance and Reconnaissance technology will be used for military operations, fighting terrorism, protecting civilian populations, border control, maritime safety, crisis management and natural disaster response. 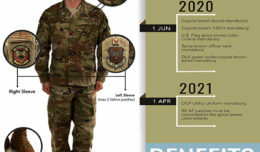 There are 15 nations contributing to the delivery of the AGS system, but all 28 Alliance nations will participate in the long-term support of the program. That same day, a team of European NATO journalists visited the Global Vigilance Combined Test Force at Edwards where they saw a Block 20/30 Global Hawk. The visit provided an opportunity for the visitors to see both the production side at Plant 42 and the operational side of the process at Edwards. The Palmdale facility provides assembly, integration, testing and long-term maintenance for aircraft including the B-2 Spirit, F-35 Lightning II, the RQ-4 Global Hawk and now the NATO Alliance Ground Surveillance System.